Marc Bartra has big boots to fill at Borussia Dortmund, but history suggests Mats Hummels' like-for-like replacement at the heart of the BVB defence is up to the challenge. Playing in front of sell-out crowds at FC Barcelona's Camp Nou must have come as quite the culture shock to Bartra. The son of a tractor driver, he grew up in the quiet village of Sant Jaume dels Domenys - a world away from the fervent atmosphere served up in his former footballing abode. Bartra joined Barca's acclaimed la Masia academy from neighbours RCD Espanyol at the age of 12. His twin brother also came through the ranks at the Catalan giants, but nowadays is a youth football coach. After being promoted to Barca's B team in 2009, Bartra made his first-team debut under Pep Guardiola in a 2-1 defeat to Club Atletico de Madrid on 14 February 2010. He won the second of five La Liga titles in 2011 - a year which also ended in UEFA Champions League and UEFA European Under-21 Championship glory. 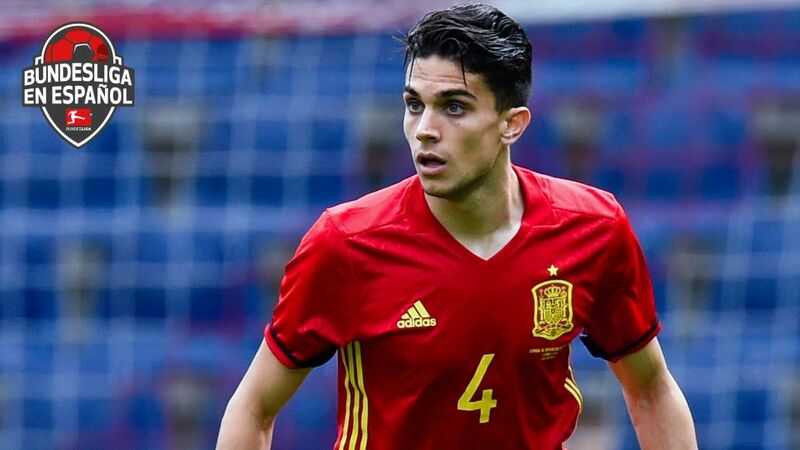 All told, Bartra turned out 154 times in all competitions for La Blaugrana, winning the Champions League once again in 2015 and adding two Spanish Cups, two UEFA Super Cups, two Spanish Super Cups and one FIFA Club World Cup to his impressive collection. It is, however, the support of the Barca fans that the 25-year-old holds dearer than any piece of silverware. "I want to give special thanks to every single Barca fan," he wrote in a heartfelt Facebook post upon confirmation of his move to Dortmund. "The fondness and love that you have made me feel every day I have been in this home have served me to keep moving forward, fighting and making sense of all the work I put in to keep defending this team and our colours. I move on with a warm heart." Bartra can expect temperatures to rise further still when he gets his first taste of the Revierderby between BVB and FC Schalke 04. The Spain international knows a thing or two about big derbies, having scored in the 2-1 loss to Real Madrid CF in the Copa del Rey in 2014. Describing Spain's Clasico as "more than just a game," Bartra's experience stands him in good stead for the 'Mother of all Derbies'. Bartra will also be hoping to set a personal record straight in Der Klassiker with FC Bayern München, after starting both legs of Barca's 7-0 aggregate defeat to the Bavarians in the semi-finals of the 2012/13 Champions League. He also featured in the Catalans' 1-1 draw with Bayer 04 Leverkusen in the 2015/16 group stage. Highs and lows have littered Bartra's career, but one man has been with him through thick and thin: idol, former Barca teammate and agent Carles Puyol. "He was my hero, the one I looked up to," he recalled. "I watched how Puyol played as I grew up. He was our captain and I watched him on and off the pitch. When I was lucky enough to get into the first team, he supported me hugely though the good and difficult times." Despite making only 13 La Liga appearances in 2015/16, Bartra has been named in Spain head coach Vincente Del Bosque's final 23-man squad for UEFA Euro 2016, where he could come up against a handful of Bundesliga representatives in the group stage alone, including Leverkusen and Turkey midfielder Hakan Calhanoglu. Away from the pitch, Bartra is a dedicated family man. He is married to Moto GP journalist Melissa Jimenez - not to be confused with the eponymous The Voice contestant - and together they have a daughter named Gala.